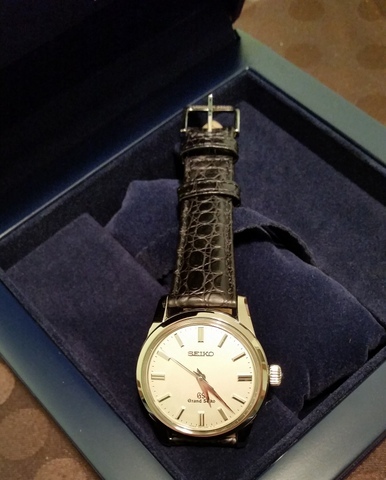 There's a fun story about Mondaine's watches. Especially fun for Mondaine, as it turns out. The original design was created by an SSB employee, Hans Hilfiker, an engineer, in 1944 and appears on railway clocks throughout Switzerland. Hilfiker’s name is a good one to know if you enjoy wristwatch history, because he created one of the most memorable timepiece faces ever. The Swiss railway watch has been part of museum exhibits in New York’s Metropolitan Museum of Art and London’s Design Museum in London as an outstanding example of 20th-century design. After a little back and forth among lawyers, Apple agreed that it did copy the SSB’s trademarked watch face. Apple paid SSB $21 million to licence the design. The Mondaine Railway Watch, of course, received a nice bit of publicity and was found on many more wrists after this. 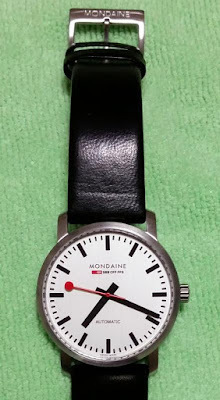 Not only is the watch’s sweep second hand iconic, but it also moves in a special way on one special Mondaine watch: On Mondaine’s quartz Stop2go watches, the second hand makes a complete rotation across the watch face every 58 seconds, stopping for two seconds at the 12 to let the minute hand advance. To allow the second hand to come a full stop while the minute hand jumps forward, Mondaine couldn’t use any ordinary quartz movement but instead had to develop a movement with two independent motors, one for the minute and hour hands, one for the second hand. Swiss Federal Railway Clocks work the same way. Letting the minute hand advance while the second hand remains motionless enabled the railways’ clocks to be synchronized around the country and Switzerland’s trains to run on time. The red second hand with the two-second stop was added to Swiss railway clocks in 1953. The second hand’s design was made in the shape of a railway guard’s signaling disc. Mondaine’s watches are among the most iconic in the world. I’d say that they’re probably the most easily and quickly recognizable watches in the world, and after Apple’s publicity gift to Mondaine, even more people recognize this watch. The Mondaine Railway Watch comes in mechanical and quartz flavors (with the Stop2go quartz being a special flavor of its own) and in men’s and women’s sizes. 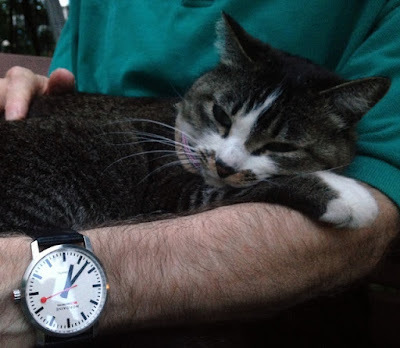 A Mondaine and a cat, perfect simplicity together. I've always loved the red second hands on Mondaine watches. Thanks for this story.